What to do when adolescence strikes! Wouldn’t it be nice to have a have a house-trained puppy who comes when you call? Each chapter in this best-selling book provides step-by-step instructions on teaching manners to new puppies. Also included are important topics like socialization, appropriate play, helping puppies conquer their fears, and how to stop unwanted behavior. It is true what they say: Practice really does make perfect, but it has to be fun or you won’t do it. The Puppy Primer not only makes it fun, it provides a week-by-week structure that is easy to follow and realistic for busy owners and distractible puppies. Equally useful as a compliment to training classes or for people who are “home schooling,” this book will help you and your puppy graduate at the top of your class. Lots of experienced puppy owners tell us they are grateful they had The Puppy Primer as a resource. Establish lifelong clients by providing effective and science-based training resources along with good medicine. We all know how serious behavioral problems can be --The Puppy Primer is an essential resource to help prevent problems in the years to come. So many problems and so little time! The Puppy Primer is an invaluable resource to support our one-on-one work with clients. Everyone will profit from enhanced communication between owners and dogs, an understanding of what is expected, and enthusiastic responses to standard cues like sit, down, come, stay and leave it. "...Puppy Primer is a must have for anyone who has or is thinking of getting a puppy. Raising a puppy can be a challenge, but McConnell's book [provides] . . . valuable support for any puppy parent. 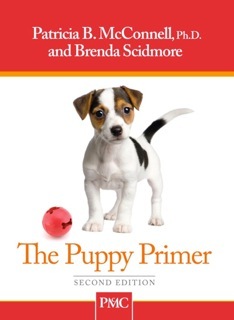 'The Puppy Primer' is also a great resource for trainers." no matter how many dogs you have raised or lived with...."